At Underdogs we take pride in being a small and personal English school. We focus on what we do best: teaching English, and building a deep relationship with each student, hopefully leading to a long history together. 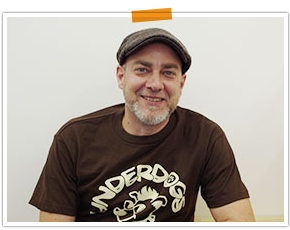 The teachers at Underdogs teach with the same philosophy: focus on giving every child the balanced education that they need, not just studying and speaking English, but preparing the children for their everyday lives growing up. And, while doing this, HAVE FUN!!! A happy child will always learn more than a bored child. Imagination and creativity are the keys to building a strong student. We make that a priority. We offer an immersion English program for Kindergarten aged children, as well as afternoon lessons for school age children. We can also help arrange pre-lesson and post-lesson supervision of students for parents whose schedule limits their drop off and pick up times. You won’t find an accurate meaning of “underdog” in a Japanese-English dictionary. Underdog means, simply, a person or team that is not expected to win. The nuance, however, is much more positive. An underdog is someone who people cheer for. Underdogs have to work much harder and can never give up if they want to win. That is why I chose this name. I believe in living life as an underdog. NEVER expect to win. Always work harder than you have to. Never think about how good the opposition is. Challenge YOURSELF, and do the best that YOU can do! As a school, our goal is to remain a small, controllable and elite school in the Kitaguchi area, whose heart and soul are committed to education and broadening our student's minds. We have chosen to remain small in order to keep our education levels higher than the larger kindergartens and preschools. Of course, having fewer students means the students can get more attention from the staff, helping increase their English levels and, more importantly, gives the staff a better opportunity to learn about the students on a deeper personal basis. It is this deeper understanding of the children that allows us, the staff, to make a stronger Kinder "team", and this "team" gives every child a chance to show their strong points. We are conveniently located 1 block north and one block west of Sapporo Station, at the south side of Hokkaido University. 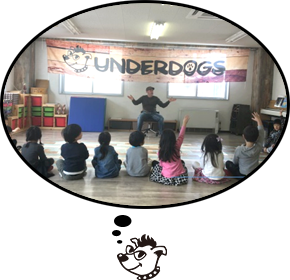 Enrollment at Underdogs starts in the “Nen-sho” year (when a child will turn 4 years old during the school year, starting April 2nd). Assuming the child has basic life and social skills, any child is welcome. The observation of the child in a play setting is required, and an interview with both of the parents of the child is preferred. As we are a small school, we don’t have placement space for many students so preference will be given to children with English experience and to those students whose parents have a philosophy that coincides with Underdogs. Enrollment is also possible in the “Nen-chu” year (child turning 5 years old) when spaces are available. Enrollment in the “Nen-cho” year (turning 6 years old) is permitted only under very special circumstances such as returnees from abroad or students whose parents are native speakers. This too, depends on space availability. Kinder is immersion English. For three years, the student will attend Underdogs four days a week, an average of four hours per day. In Kinder, the 1st year focuses on building a strong speaking base and group dynamics. The 2nd year is the introduction of basic reading skills and group responsibilities. The 3rd year is the introduction of basic writing skills, and group leadership. Kinder has many events every year, including celebrating all of the main Western and Japanese special days (Christmas, Setsubun, Halloween, ect), and going on picnics and field trips. We also have the yearly Kinder Sports Day and Graduation. Learning in Kinder is all about the kids learning how to think by themselves. Using imagination, using daily life experience and using common logic is the reason Underdogs Kinder has the high level it does. We encourage the children to develop their own characters, and getting to know their own weak and strong points as not only students, but also as people. And, of course, learning about the world we live in. In Kinder, the children build their fluency and speaking abilities. In the afternoon lessons they organize what they have learned through a deeper study of English grammar and usage to maintain their English fluency. The afternoon lessons are a continuation of Kinder, with the focus transitioning away from immersion English to a more study based lesson. The curriculum used is original and created to strengthen English in all areas. While the curriculum becomes more in depth as the child grows older, Underdogs teachers still focus on having fun while learning!